The commission: a musical piece for the Museo de Arte Moderno (MAM)/Chiloé Modern Art Museum. I run to get the recorder and a couple of clothes for what the Chilote night might bring. Airplane. Clear sky, descent through clouds and landing in Puerto Montt. Now on land, the sky is grey and overcast; Puerto Montt is always ugly in the mornings, just like a friend of mine. A custom brush-painted Suzuki Celerio car and off to the Chacao Channel. Crossing and first takes; I am already an extraterrestrial, an alien in search of the sounds of the island. People look at me in a weird way. The anti-gravitational mask facilitates isolation, I breathe my own air, my own contamination; I am here for what I am here and I feel like the first settlers that arrived in Chiloé. They say there were keels reached the seashore, that they covered the whole island. That nature in this end of the world makes no concessions. Rec mode recording it all, all of the sound space my headphones amplify; the footsteps on the sand, the creaking of the giant-rhubarb plants, the rubbing of the grass and the murra weeds, the buff-necked ibis and slender-billed parakeet calls off in the distance. Dogs bark, far off playing children’s voices, the omnipresent inland sea, the streams, the water basins running as if searching for the poncho the devil lost in these latitudes. I pick up a handful of soil, which also sings, everything is alive, full of life. Everything is like a great symphony not deserving the pause mode. I keep on. I arrive at the MAM, the hospitality is warm and night falls. Pause, now indeed. Deep sleep; I dream with ancestral rituals, with a deserted beach and a pig’s head speaking to me. The head is now on my shoulders, I see my porcine image reflected on the crystalline waters of a brook… where does all this come from? I wake up instantly. It is 4 AM and the itinerary marks Cucao as the next stop. I pass by a butcher’s shop, they present me a pig’s head, I want it to speak to me, to sing in Mapudungun, for it to tell me something to return me to that unsettling dream. Arriving at the coast, open sea, a crunching ground of clams, mussels and seaweed. Everything ends up in the recorder’s SD card, the microphone is fuming and the pig’s head flies by my astonished glance; it perches on a forgotten totem in the midst of the beach. The ritual comes alive. Several huilinche natives come closer, white eyes, spun ponchos. They sing improvised hypnotic melodies. I do not understand a thing. We are all happy. Chicha (fermented or non-fermented beverage usually derived from maize), milcao (a type of potato pancake prepared with raw grated potatoes and cooked mashed potatoes mixed with other ingredients) and chapalele (dumplings). Fire, we light a fire and throw the pig’s head in the live coal. Sitting in a semicircle we eat it, smoking and tasty. The dogs take care of the remains; I also record; everything registered, captured, appropriated. The men walk away, their steps echo in my ears. Guts digest the food and drink. More sounds, the wind, the flames still moving. Rain, the rain is coming and soaks me from my feet to the mask. I cannot see, I am blind and only the audio shows me the way back. The black brush-painted Suzuki now is a wagon with wooden wheels being pulled by oxes. I am returning, I cross the Chacao Channel, direction north. Boarding pass. Back to planet digital, memory full. I turn on the Mopho, the Mochika and the Korg; Roland passes and the computer subtly slow cooks the sound brew extracted from the southern land. The delivery: the register is alive, it comes to life. 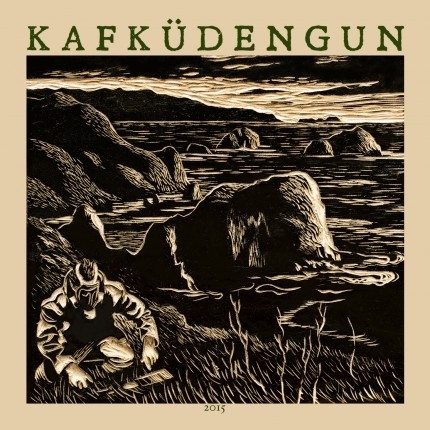 KAFKÜDENGUN is the Mapudungun word meaning “to speak into one’s ear”, exactly what the mysterious Chiloé island did with me, and that is the whispered story represented in this musical iece. He is a founding member of the mythical band Pinochet Boys and later Parkinson in the 90s; composer willingly at the margin of massive dynamics, always with his glance on the search for new proposals. KAFKÜDENGUN is a musical piece especially composed for the Chiloé modern art Museum based on the sounds of the island, in which he develops his particular sound vision starting from the research of technical and musical resources, such as programing, sequences, polyrhythms and above all field recordings gathered in Chiloé. An invitation to submerge in the sounds and with the trip to the landscapes of southern Chile.